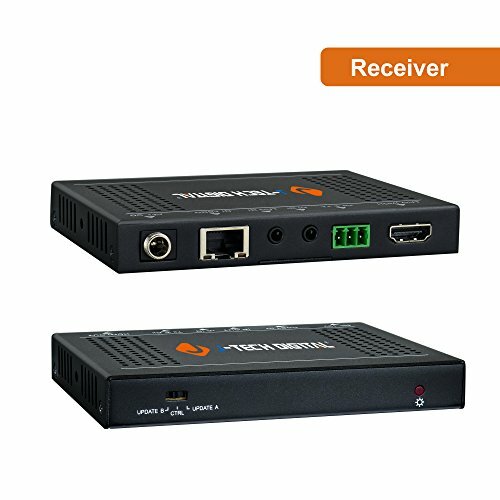 JTECH-EX-HDBT219 is an ultra-thin HDBaseT extender for HDMI and bi-directional IR signals. It transmits 4K signal up to 131ft (40m), 1080P signal up to 230ft (70m) over single Cat5e/Cat6 cable. The extender set supports PoC function, which makes no need of power supply at the receiver end. 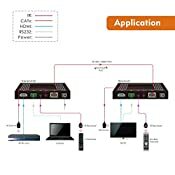 Transmission distance reaches up to 70 meters under the video format of 1080P and 4K up to 40 meters. LED indicators to show the power status. ✓UNCOMPRESSED 4K@60HZ EXTENDER: Extend 1080P up to 230 feet (70 meters) or 4K up to 131 feet (40 meters) over Cat5e/6 UTP cable. The extender supports latest YUV4:4:4 color space and 4K 60HZ refresh rate. ✓HDMI 2.0 FULL COMPLIANCE: Supports latest high dynamic range (HDR10@4K60HZ), a new standard for Ultra HD televisions with the potential to vastly improve the viewing experience; LATEST HDCP 2.2 / 1.4 COMPLIANT: HDCP 2.2 is the next generation of copy protection for the 4K era; . he video is transmitted using a visually lossless video technology to ensure a HD lossless transmission. ✓DOLBY DIGITAL AUDIO: Supports Dolby True HD, DTS-HD Master Audio which increases your sound system to next level. The device is also compatible with other HD multi-channel audio formats (Stereo, LPCM 5.1/7.1) pass through. ✓DUAL IR Backward and Forward Extension: Extends IR signal from source to receiver or from transmitter to receiver. BI-DIRECTIONAL PoC(the Receiver is powered by the transmitter). 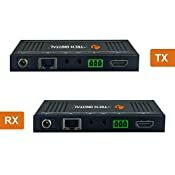 Phoenix RS232 Port for firmware update or RS232 control signal transmission. ✓For better performance, we suggest using solid COPPER ethernet cable with this product. For GUARANTEED optimal performance, use the J-Tech Digital Customized 150ft Cat6 Ethernet Cable. Please search the ASIN number "B01IPYVT3Y" on Amazon for more details.